Photos by Mike Yip and Kim Wetten with the VIU Bird Banding Project. This small, dusky songbird is relatively plump and has a rounded head. It is grey to olive-green above and whitish below; its fresh fall plumage tends to be greener, with yellowish flanks. Its only head markings are a dark line through the eye and a white eyebrow which usually extends forward to the bill. Its song is warbling, upbeat, melodious, and without an obvious pattern. Click here to listen to examples. 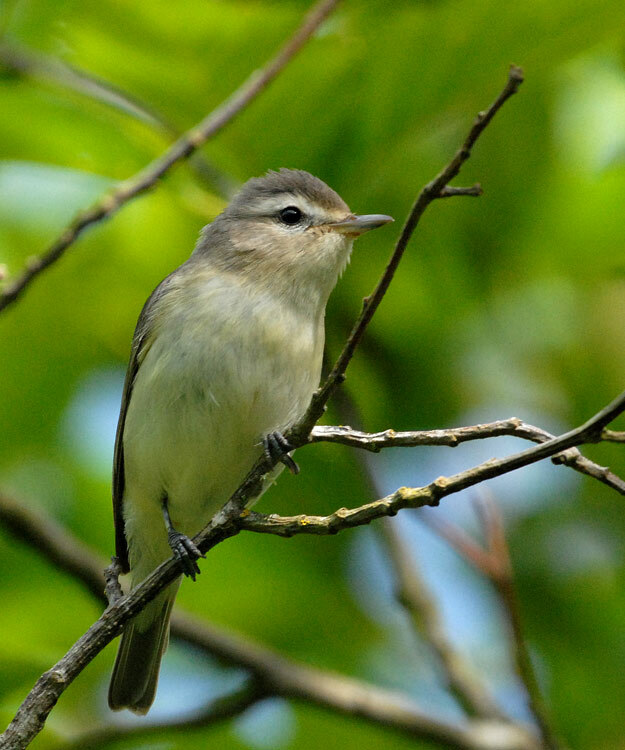 The warbling vireo inhabits open forested areas: deciduous woods, mixed coniferous-deciduous woods, and forest edges. It avoids dense, mature coniferous forest. It is found across much of North America during the summer breeding season. In the west of its breeding range it nests in shrubs and small trees as well as larger trees. Its winter and year-round ranges extend from southern Mexico to parts of Central America. 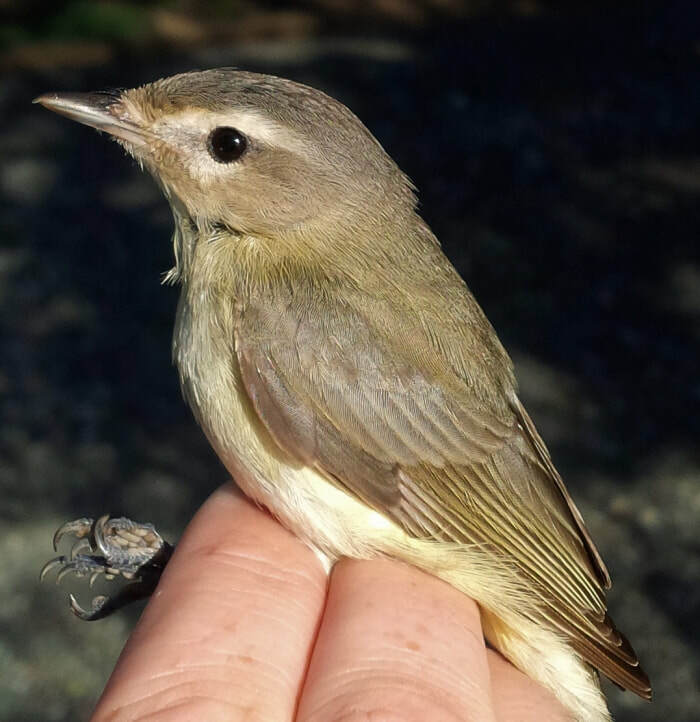 Other small, grey or olive-green birds found on the coast include the Pacific-slope flycatcher (Empidonax difficilis) and the ruby-crowned kinglet (Regulus calendula) when its bright red crown patch is not visible. Both have relatively large heads, white eye rings, and wing bars. Their bills are also smaller and straighter. This species is thought to be more common now than it was before European settlement of North America, as the resulting forest clearing and fragmentation increased the amount of its preferred habitat. Warbling Vireo. The Birds of North America Online (A. Poole, Ed.). Ithaca: Cornell Lab of Ornithology; Retrieved from the Birds of North America Online. Accessed 20/06/2016. Warbling Vireo Vireo gilvus. Audubon Birds. National Audubon Society. Accessed 20/06/2016. Dunn, J. L. and Alderfer, J. (Eds.). (2011). National Geographic Field Guide to the Birds of North America. (6th Ed.). Washington, D.C.: National Geographic Society. Pp. 356-357.